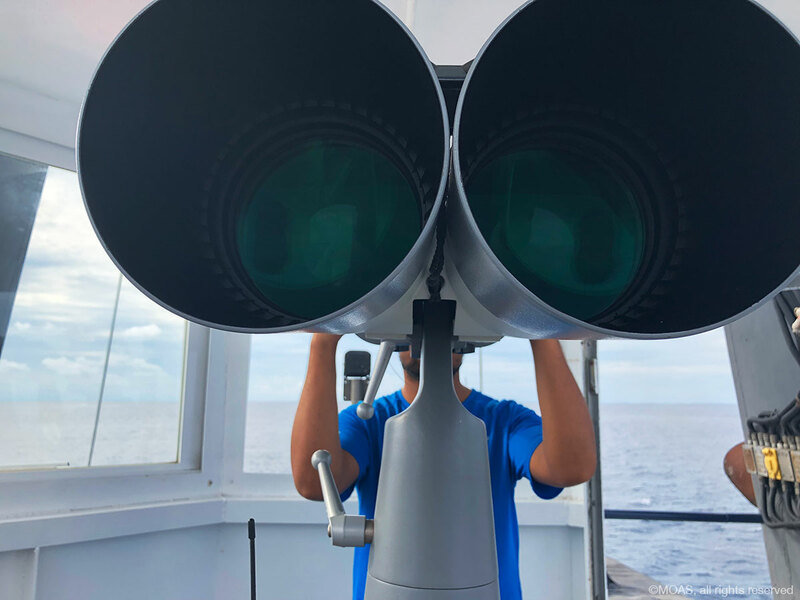 MOAS (Migrant Offshore Aid Station) has successfully concluded the second week of its observation mission in the Andaman Sea, where M/Y Phoenix is monitoring maritime developments in the Rohingya refugee crisis. Having departed Sri Lanka on April 23rd, M/Y Phoenix has now covered 1,643 nautical miles (over 3,000km). During this time, MOAS has traversed four national SAR (Search and Rescue) regions, namely those of Sri Lanka, India, Malaysia and Thailand. Our crew is on round-the-clock lookout for objects appearing on radar without an AIS (Automatic Information System) signal. All contacts, or unidentified objects, have been thoroughly investigated, both using high-powered binoculars and by altering the ship’s route as required. So far, MOAS has investigated 135 contacts in total, mostly small fishing vessels. Although observation is the main aim of this mission, MOAS is fully prepared to carry out rescue operations, should an emergency arise. M/Y Phoenix is travelling with an experienced SAR team on board, which includes medical personnel. In order to maintain readiness, our crew has been using specialised RHIBs (Rigid Hull Inflatable Boats) to conduct rescue drills. Given that our mission aims to increase transparency in SAR operations in this region, we have been pleased to note that our work as an independent NGO has drawn the attention of national maritime authorities, both at sea and in the air. Unfortunately, MOAS has also been subjected to intimidation tactics which have obliged us to make changes to our schedule. On May 3rd, M/Y Phoenix received a call from a corvette belonging to the Thai navy, which had been shadowing us for several hours, to inform us that we would not be allowed to anchor without express permission from Thai authorities. Given that we were in contiguous waters, where commercial vessels are entitled to anchor freely under international maritime law, this communication was highly irregular. Our plan for the coming week had been to enter Phuket port on the afternoon of May 4th, in order to spend six days monitoring the seas between Phuket and Ranong, on the border with Myanmar. However, we were informed that our movements would be severely restricted if we entered Phuket, preventing us from carrying out our intended observation work. Given the impossibility of conducting monitoring operations in this area, we have decided to cancel our intended ports of call in Phuket and Ranong. These challenges are not new to MOAS. We encountered a very similar situation during our first exploration mission to the Andaman Sea, in February 2016. Nonetheless, we have been disappointed to face this level of intimidation, particularly given our extended efforts to foster a positive relationship with Thai authorities, both before and during this mission. Despite attempts to disrupt our work, MOAS’ mission continues. Over the next two weeks, we will continue to scan international waters and gather information on boat departures. MOAS calls on international humanitarian organisations to support this maritime mission, and on regional governments to uphold the spirit of the 2016 Bali Declaration. Our observation and monitoring operations are currently scheduled to continue until May 20th.